Take naturally-occurring extremely high tides, and add to them high winds and torrential rain, and you get some pretty big seas. At least, that’s what I got out on the San Francisco Bay today. How big exactly, is hard to say (our uneducated guessed ran the gamut), but they were big enough to wash over the bow of our 26-foot boat on more than one occasion and to keep most of us aboard holding on for dear life for much of the three-hour voyage. What I can say for sure is that as I type this blog post, four hours later, my body still feels like I’m rolling up and down and back and forth on some stormy seas. We braved the weather today to check out the latest round of “king tides” and see how they affect low-lying shorelines in places like Crissy Field, Treasure Island, and SFO. The seas were so rough that we didn’t make it all the way to the airport, but we did see waves crashing over the sea wall along the Embarcadero just south of the Ferry Building (see video below). At Crissy Field, the beach was nearly submerged and a small footbridge near the mouth of the estuary was almost awash. “We think this is indicative of what a normal high tide will be as we start to see the effects of sea level rise in the coming decades,” said Jason Flanders, a staff attorney for San Francisco Baykeeper, the organization that supplied the boat for the white-knuckle outing. Sea levels in the Bay Area have risen about eight inches over the last century, and officials are planning for an additional rise of 16 inches by 2050 and 55 inches by the end of the century. Nutters is part of a new effort called the Bay Area King Tide Photo Initiative, which aims to encourage members of the public to document extreme high tides by taking photos and sharing them online. 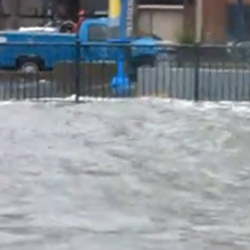 There are other efforts to document king tides on the west coast, including one in San Diego.